Review Context: My only experience with a game similar to this is Salt & Sanctuary. I have never played more than a little bit of Dark Souls, or anything in the franchise. 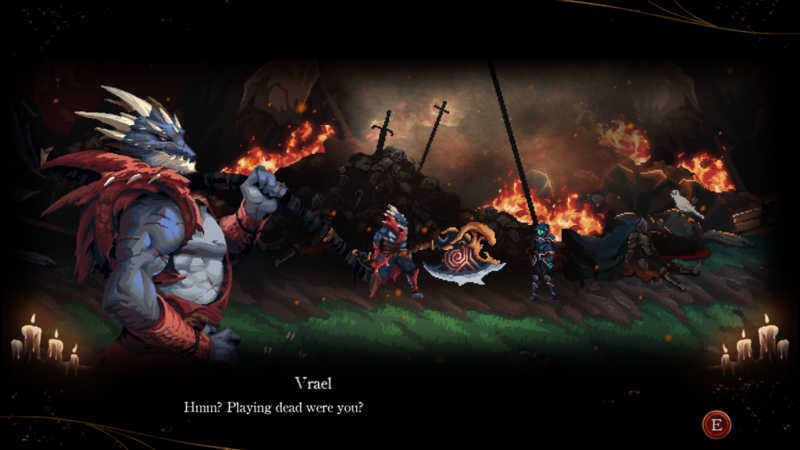 Death’s Gambit, developed by White Rabbit, is a 2D action-RPG that is clearly inspired by Dark Souls and other games in the franchise. 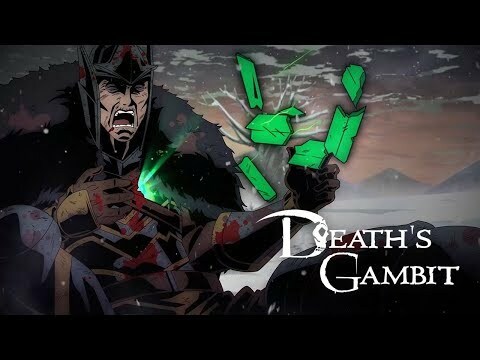 As someone who hasn’t played much of the ‘Souls series, but respects the type of difficulty setting, Death’s Gambit was an interesting experience for me. Death’s Gambit is an interesting experience that does a lot of interesting things, but falls short in other ways. When you start the game you get to choose from seven different classes, as well as choice of a starting item. Each class also starts with its own set of weapons and distribution of stats that helps serve as a roadmap of what the best proportion of stat distribution should be as you level. Players are of course not restricted from going in any stat direction they prefer. I chose the Blood Knight class, which has some inherit combat healing powers and starts with a one-handed axe and shield, as well as a scythe. In the beginning players will also start out with one special ability. In Death’s Gambit you play as Sorun, who is resurrected by a character named Death after dying in a battle at his home in Vados. The game begins with this and his desire to return home to Vados to find his mother, as he meets Death for the first time. This is where the game begins as he is handed a Death’s Contract. You will meet many other characters, like Vrael who help tell the story as you play the game. The main story narrative surrounding Sorun searching for his mother is easy to follow, but some of the plot points surrounding other characters can be a bit confusing with how the story is told. The plot surrounding Sorun’s mother is somewhat predictable. As you play through the game you start to realize there is a variety of items, particularly shields, with many different perks. Every player also starts with Phoenix Feathers, which can be used to heal in battle. During the course of the game the maximum amount of Phoenix Feathers a player can hold is increased, as different types of Phoenix Feathers that provide different buffs when used. When you start the beginning game there is a certain element of player choice of what area to go to, with some areas blocked off where you need to either open a door from the other side or own a specific item. In Death’s Gambit soul shards are used to purchase items and level up your character. Similarly to a game like Dark Souls, instead of a bonfire, players use Dark Shrines as a checkpoint and to level up stats. You will quickly realize that leveling up is fairly cheap to do early on, with shards easily farmable for a quick level increase if you desire to do so. As you explore Death’s Gambit you quickly realize that the area is not that big. I can best describe it as a sunflower, with the town in the middle and different areas surrounding it. The world is actually very easy to traverse on foot, even if Sorun has a horse available, which can only be used to travel across certain areas. As you advance your way through the game you will notice that the weapon choices are very few, as I there seems to be only one one-handed axe in the game. This is a bit disappointing, but there is at least a way to upgrade your weapons with Soul Stones. Another curious design decision is the talent tree, which is the same for every class. A specific talent tree per class is preferred, but many of the buffs in the talent tree clearly useful for any class. Unfortunately, the talent tree did feel like something that was tacked on and not fully thought out. To be honest, the game could probably do without the talent tree and still be as good as it is. Another disappointment is the choice of special abilities, as there is a very small selection of them. Every player can equip up to three different abilities, with each ability using Soul Energy that can be only be obtained in combat by slaying enemies and it depletes over time. Abilities are gated by weapon and stats, not class. Technically a player can buy every ability, but the stats requirement will most like be the restrictive measure. One of the great parts of these types of games are the boss fights, as Death Gambit has some interesting ones. I can’t lie, I died a bunch of times to some of them. Even with my lack of experience playing a game like Dark Souls, I didn’t find the boss battles all that bad. Patience, good dodge movement, and understanding the attack patterns is key to victory. Some of the bosses are very well designed in how they attack, while some of boss battles are kind of bland. Each boss drops one talent point after defeat. If you are brave, you can return later and choose to fight the Heroic mode of the boss, which is tougher and drops better loot. Some bosses even have abilities that can be purchased. Unfortunately, some of the boss normal boss fights did feel a bit unrewarding, as some fights only dropped Soul Shards and no other goodies. 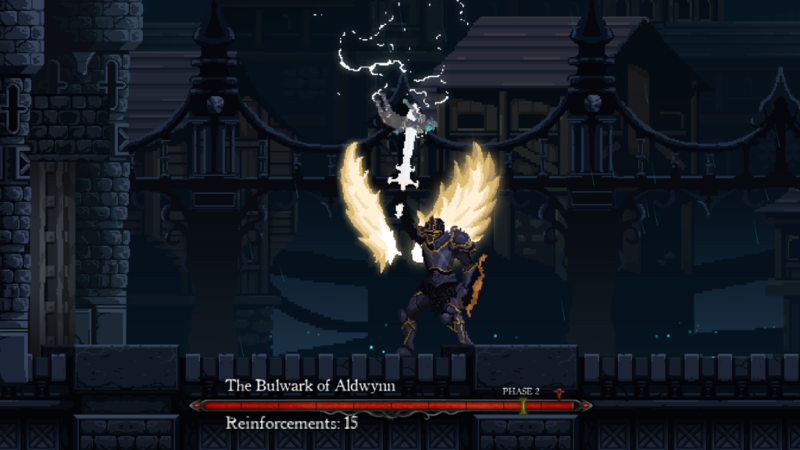 The combat in Death’s Gambit is very responsive, and never once did feel like I pressed something and it didn’t happen. You can parry enemies, which for me I could only pull off sometimes, as I didn’t want to risk death because enemies can hit very hard. Controller is strongly recommended, as I can’t see how someone can play with a keyboard and mouse for this game. During your playtime you will die plenty of times, but unlike Dark Souls, you don’t lose anything except a Phoenix Feather, which is subtracted from your total, that can be re-acquired by going back to where you died. If for some reason you died and don’t want to go back to that location, you can reclaim the Phoenix Feather at a Dark Shrine for a price. Due to death being a major theme in Death’s Gambit, death can be quite an event, as Death will appear and say something. In some instances you will see a cutscene for some story lore, or brought to another location. Although Death, voiced by Matt Mercer, is probably the best character in the game, the death cutscenes are way too frequent early in the game. I was a little surprised to see how disproportionate the distribution of cutscenes in the beginning was compared to the late game. 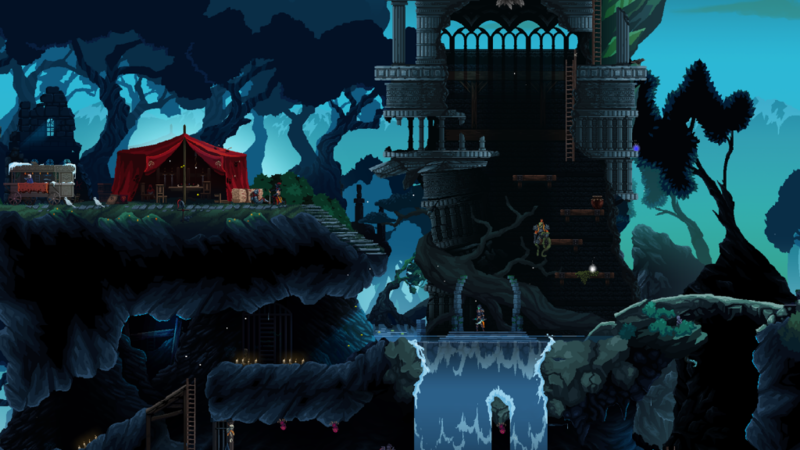 I can’t discuss Death’s Gambit without discussing the graphics, sounds, and soundtrack. The character combat animations and art direction are good, as well as the sounds associated with combat. Although Death’s voice acting (Matt Mercer) is the highlight, other characters like Sorun’s mother are also voiced, but Sorun isn’t. The voice acting generally is pretty good as a whole. The soundtrack is good throughout the game, with boss fight music being the best to pump you up. All in all, Death’s Gambit is a good game for the genre, even if it has curious design decisions that make you scratch your head. The game world in Death’s Gambit may be kind of small, but it is a rich experience that will give you many hours of playtime. Players can either restart from the beginning with a new class, or start from the beginning with their existing character and items in New Game+ for a greater challenge. For my lack of experience level in this kind of genre, I never felt overwhelmed by the difficulty to the point of considering quitting, which is a testament to the accessibility of the game. Death’s Gambit, even with its flaws, is a game I would still recommend.